Two months ago, I got me a copy of Bobby Patrick Band's interpretation of the 'Dallas' theme, but that was of course not the original version. I didn't even know if it was ever released on vinyl, but it turns out that it was. And as a child of the Eighties, of course I had to have the track. The track features on the B-side of this single, but the A-side is best left forgotten. Written by Michel Salva and Jean Renard, it's a French retelling of the TV series' story line. 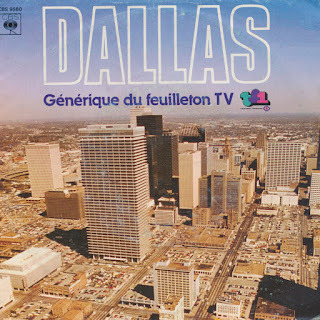 For some reason, CBS Records was interested in releasing this in France, but the inclusion of the original Jerrold Immel-conducted 'Dallas theme' on the B-side warrants the 50 eurocents I shelled out for this piece.